When it looks like spaghetti, it may be fishing. That’s one of the first lessons students learn when they’re working with Kristina Boerder, one of our academic partners from Dalhousie University in Halifax, Nova Scotia. Of course, she’s not teaching them about pasta. She’s teaching them about the movement patterns of ships at sea. The students are helping Kristina classify the tracks of ocean-going vessels recorded from satellite signals. Dalhousie University student, Ciara Willis, analyzes vessel tracks off the coast of Norway. When we spoke with her, she gave us a quick rundown of what vessel tracks look like on a map of the ocean. “Cargo ships and tankers are relatively easy to identify,” she said. “They move from port to port in a fairly straight line at a fairly steady speed.” But when a vessel’s movements become erratic, creating a track of squiggly lines that Kristina described as resembling a plate of spaghetti, then you know it’s doing something other than transporting cargo. Large commercial fishing vessels are required to carry an Automatic Identification System (AIS) beacon that allows satellites to track their movements, and to some extent, what they’re doing based on codes the captains enter into their system. 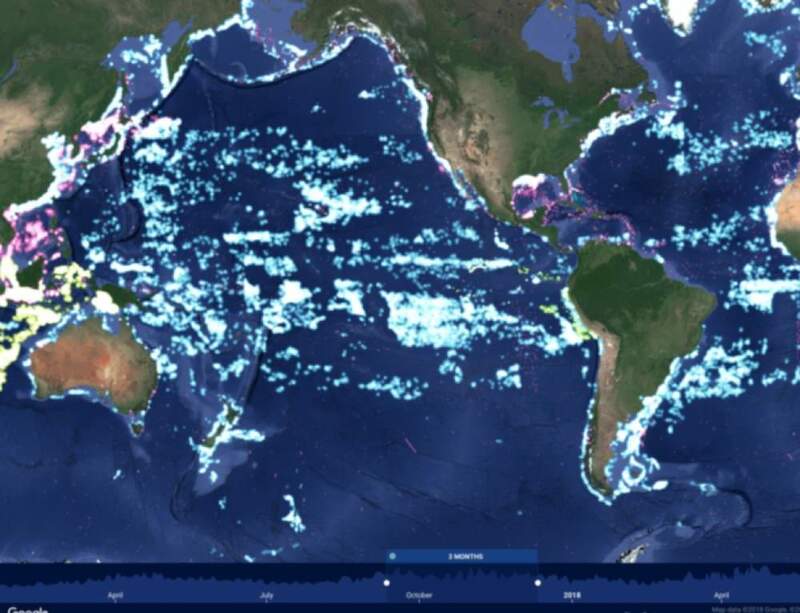 About 70,000 vessels report they are fishing, but the signals don’t identify the kind of fishing they are doing. What’s more, self-reporting isn’t entirely reliable—either intentionally, or accidentally, vessel operators sometimes enter the wrong codes. Some vessels are fishing but don’t report it, while others falsely report fishing when in fact they are doing something else entirely. Trawlers for instance zig zag back and forth, moving at a constant speed, dragging nets behind them to collect their catch. Purse seiners, on the other hand, travel quickly in a tight circle, closing their nets around a school of fish in a matter of minutes. Longliner tracks are spikey, tracing the same line again and again as they set their hooks and return to retrieve their catch. Examples of the tracks students are using to classify fishing vessels. 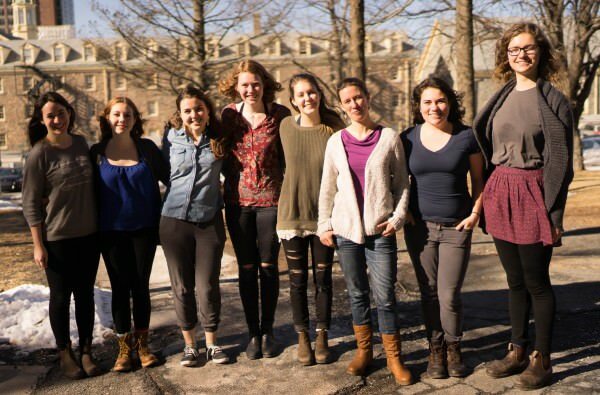 Kristina can usually distinguish one “species” of vessel from another, and nearly a dozen undergraduate students from Dalhousie University have learned to do the same. But codifying what they do into a precise set of rules to accurately identify a vessel at sea is not as easy as it would seem. Not only do patterns vary with the size of the vessel, but non-fishing vessels can throw a curve ball into the mix. A sailboat meandering along a coastline without an obvious purpose might look a bit like a fishing boat. An offshore supply boat that steams toward an oil rig then stops can confuse an untrained eye. “We’re operating on a majority vote system,” Kristina said. “Several of the students will see the same vessels in the program they are using, and if five of them classify it as a longliner, we assume it is a longliner.” In addition, they ground-truth their assumptions with a credible source such as a ship registry, or photos and videos from the web. Often the fishermen themselves post videos on YouTube of their days at sea. Those images help the team correlate vessel names and numbers with the fishing gear on board. The hardworking students from Dalhousie University are helping us refine our track classification algorithm. It’s been a tedious task and a heroic effort by the students to create a database of thousands of vessels, each labeled as to the kind of activity it’s engaged in. 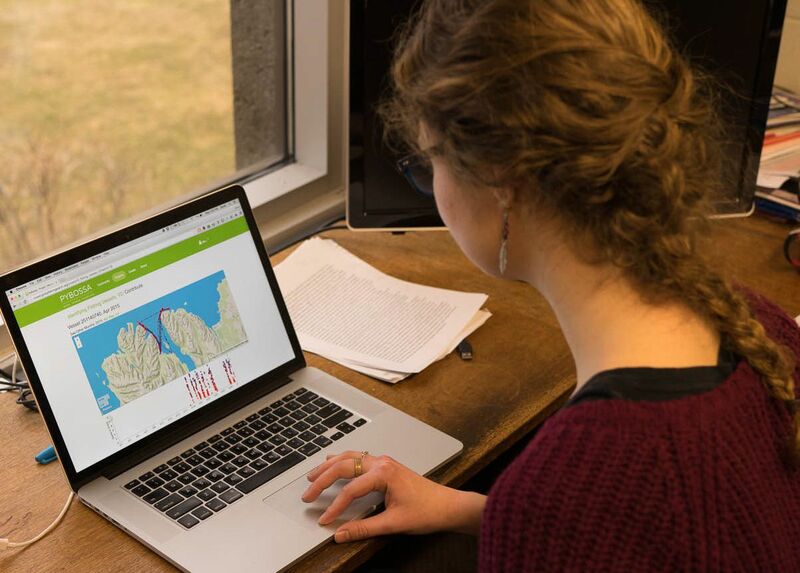 Through our partnership with Dalhousie University, Kristina has opened up her treasure trove of data to Global Fishing Watch, providing us with thousands of tracks—representing millions of data points—categorized by fishing type. Right now, our database of fishing vessels is based on a combination of public vessel registries and the list of vessels that are identifying themselves as “fishing” in the AIS signals. It likely has some errors, and it doesn’t categorize fishing vessels by type. 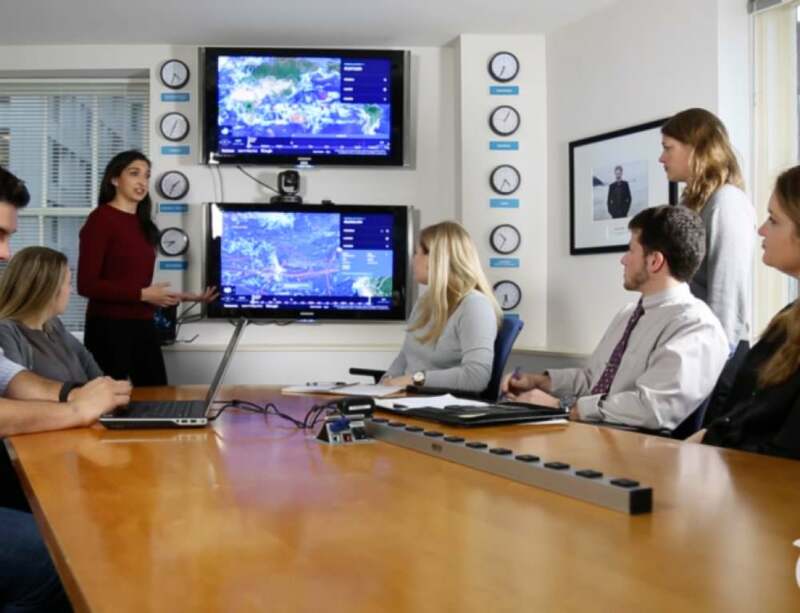 But when our tech gurus feed Kristina’s detailed data into our algorithm, it will analyze the patterns and identify a much more precise set of rules to distinguish a fishing boat from a non-fishing boat, and a trawler from a longliner or purse seiner. The platform we’re using employs a method of machine learning called “neural network modeling” or “deep learning” in which an analyst feeds lots of examples of something into a computer and asks it to find specific patterns. The beauty of machine learning—other than the fact that a computer can analyze millions of data points that would take a human forever—is that you can continually add new information to build an even more refined model. Alex Wilson, one of our software engineers from Google, has recently added a feature to the algorithm that considers not only a given vessel’s track, but all the vessels within a square kilometer. “If there are a lot of vessels in close proximity, then fishing is very unlikely to be happening,” he said. “You’re probably in a port or an anchorage.” Humans looking at the AIS signals on a map might recognize this because they have more information in front of them, but a computer only has the information it’s been given. 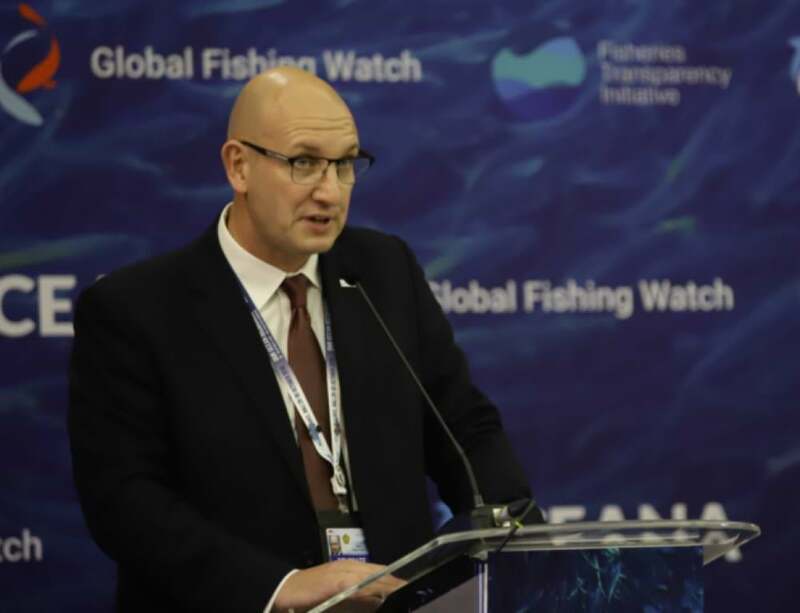 That’s the basis of what we’re working on; telling the computer what to look for and asking it to turn that into something meaningful that we can say about fishing activity. Although currently AIS is not universally required, it is possible to equip all commercial fishing vessels in the world with the technology. “It’s a novel idea we are introducing,” said Kristina, “and it’s a pretty big idea. But if you think about it, we’re tracking planes, we’re tracking football players, we’re tracking every single person that owns a smartphone.” If regulations evolve to the point that every vessel must carry AIS, our platform will allow everyone with an internet connection to identify and monitor every single fishing vessel around the globe.